The owner of a business providing ultra-secure BlackBerries to the Sinaloa drug cartel and other organizations has been arrested following a multi-agency law enforcement operation, according to an Affidavit filed in the Southern District of California located in San Diego. Working in conjunction with Canadian and Australian authorities on an operation dating back to at least 2015, authorities raided the business and home of Vincent Ramos, 41 - founder and CEO of Canada-based Phantom Secure, who is charged with racketeering conspiracy to conduct enterprise affairs, conspiracy to distribute narcotics, and aiding and abetting the cartel. Ramos sold over 20,000 phones worldwide, mostly to "the upper echelon members of various transnational criminal organizations." In fact, investigators were unable to identify "even a single legitimate Phantom Secure user." Ramos appeared in a Seattle Federal Court on Thursday and was ordered detailed pending his transfer to San Diego where he will stand trial. According to the heavily redacted filing written by FBI Special Agent Nicholas Cheviron, the encrypted phones "were specifically designed to prevent law enforcement from intercepting and monitoring communication on the network," by disabling key functionalities which can be used for tracking and surveillance. Phantom Secure - founded over a decade ago, guaranteed clients that if their BlackBerry is captured by law enforcement or otherwise compromised, they will remotely wipe its memory. "when Phantom Secure receives the Blackberry handsets, its technical team removes the hardware and software responsible for all external architecture, including voice communication, microphone, GPS navigation, camera, Internet, and Messenger service," reads the Affidavit. "Phantom Secure then installs "Pretty Good Privacy" (PGP) encryption software and "Advanced Encryption Standard" (AES) on top of an email program, which it routes through encrypted servers located in countries, such as Panama and Hong Kong, believed by Phantom Secure to be uncooperative with law enforcement." The company then masked the location of its servers containing the encryption keys and email through "multiple layers of virtual proxy networks." Saudi Arabia notably banned the use of BlackBerry phones in 2010 due to their already robust encryption due to the fact that they couldn't perform surveillance thanks to the phone's encryption capabilities. Similarly, Phantom Secure used their own encryption software routed through servers under their control. In order to do business with Ramos, a new customer would require an existing customer to refer and vouch for them. Each phone also requires a $4,000 - $6,000 per year subscription to communicate through Phantom Secure's encrypted network. Ramos funneled profits from device and service sales through various shell companies, and used cryptocurrency such as Bitcoin to "launder its ill-gotten gains and maintain its members' anonymity." “We made it—we made it specifically for this [drug trafficking] too,” Ramos told undercover agents, according to a transcript included in the court filing. User names of cartel members obtained by investigators included the phrases "Leadslinger," "the.cartel," "trigger-happy," and "knee_capper9." At one point, the Australian Federal Police began surreptitiously using a Phantom Secure BlackBerry seized from an Australian national arrested for drug smuggling. Authorities communicated with an unknown individual with Los Angeles, where they set up a deal for 16 kilograms of cocaine. “Proven. Reliable. Uncrackable. Benchmarked. Simply Secure,” another of Phantom PGP’s Instagram posts reads, along with one of the phones and the interior of a Bentley car in the background. Phantom PGP tries to push an image of luxury and exuberance, judging by other posts—attractive, scantily-clad models, landscape-shots from scenic hotels, and exotic pets all pepper the account. Although many of the photos appear to be lifted from other sources, with Phantom PGP just re-uploading the pictures for their own use, others do include original marketing material and images of the phones themselves. But it’s the Instagram account’s crime-related images which are most audacious. A bizarre mix of assault rifles, bundles of cash, drugs, and inspirational memes. “Don’t take it personally, it’s just business,” another of Phantom PGP’s posts reads. Update: After the publication of this piece, the Phantom PGP Instagram account closed down. “Two can keep a secret, if one of them is dead,” one reads. The account even includes images of iconic crime figures in film and TV, such as Scarface, Walter White from Breaking Bad, and Tony Soprano. All of this would probably be just slightly over-the-top and traditional marketing, if Phantom’s CEO wasn’t facing charges of racketeering conspiracy, conspiracy to distribute narcotics, and aiding and abetting. According to the complaint, Vincent Ramos, Phantom’s owner, told undercover investigators “We made it—we made it specifically for this [drug trafficking] too,” referring to his company’s phones. Phantom PGP did not respond to an emailed request for comment. Two other Instagram accounts online at the time of writing also share Phantom marketing material, but don’t push the high-end lifestyle image quite so explicitly. Another Instagram, this time advertising a custom BlackBerry device from a company called Sky ECC, shows a man holding a bundle of cash in a sports car along with his phone. Other firms in the secure phone space, including Sky ECC and MPC, have advertised their products on crime news websites (Sky previously said that advert was not their own). A Twitter account tweeted photos of a similar device from EncroChat along with a spread of cash. To be clear, there may be legitimate customers of some secure phone firms or resellers. But in Phantom’s case, the complaint claims law enforcement agents were not able to identify one. Although it’s difficult to determine whether any of the Instagram posts directly led to any sales, Phantom has allegedly been successful at specifically providing its wares to the criminal underground. According to the criminal complaint, written by FBI Special Agent Nicholas Cheviron, the “upper echelon members” of transnational criminal groups have bought Phantom phones, and a source familiar with the industry previously told Motherboard the devices have been sold in Mexico, Cuba, and Venezuela, as well as the Hells Angels biker gang. International organized crime and drug trafficking groups were dealt a blow by the takedown of an encrypted communication service they used to plan and commit their crimes, the FBI and its international partners announced yesterday. Canada-based Phantom Secure was a criminal enterprise that provided secure communications to high-level drug traffickers and other criminal organization leaders. The group purchased smartphones, removed all of the typical functionality—calling, texting, Internet, and GPS—and installed an encrypted e-mail system, so the phones could only communicate with each other. If a customer was arrested, Phantom Secure destroyed the data on that phone, which is obstruction of justice under U.S. law. In an attempt to thwart law enforcement efforts, the company required new customers to have a reference from an existing user. Given the limited functionality of the phones and the fact that they only operate within a closed network of criminals, all of Phantom Secure’s customers are believed to be involved in serious criminal activity. Most of Phantom Secure’s 10,000 to 20,000 users are the top-level leaders of nefarious transnational criminal organizations in the U.S. and several other countries, and the products were marketed as impervious to decryption or wiretapping. In collaboration with the Australian Federal Police, Royal Canadian Mounted Police, and law enforcement agencies in Panama, Hong Kong, and Thailand, Phantom Secure’s founder and chief executive Vincent Ramos was arrested in Bellingham, Washington, on March 7. Four of Ramos’ associates are fugitives. They are charged with conspiracy to distribute narcotics and Racketeer Influenced and Corrupt Organizations (RICO) Act violations. This case is the first time the U.S. government has targeted a company and its leaders for assisting a criminal organization by providing them with technology to “go dark,” or evade law enforcement’s detection of their crimes. The FBI takes an enterprise approach to transnational organized crime, taking down criminal organizations from the top using the RICO Act. The sweeping investigation allowed the entire illicit operation—and its technological infrastructure—to be taken down at one time. THE head of a US firm is believed to have supplied phones to criminal organisations which could have links to at least two Aussie underworld murders. The murder of bikie Tyrone Slemnik was organised through the use of phone encryption, detectives believe. THE boss of a company that allegedly supplied encrypted phones to criminal organisations with possible links to at least two Australian underworld murders has been arrested in the United States. 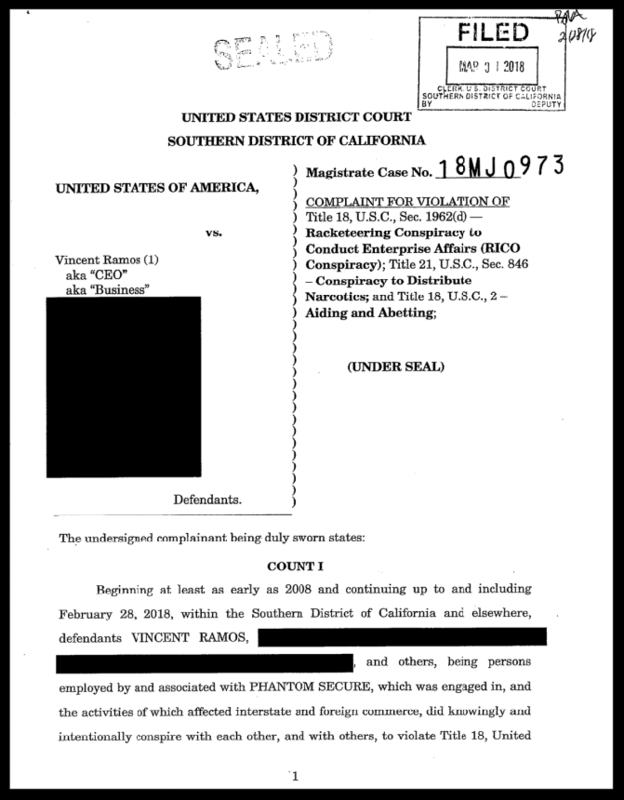 Chief executive of Phantom Secure, Vincent Ramos, was charged by the FBI for racketeering activity involving gambling, money laundering and drug trafficking after a joint operation between law enforcement agencies in the US, Australia and other countries. The company allegedly installed encryption software and removed the camera, microphone, GPS navigation and other features from BlackBerry devices to help organised crime groups avoid detection from law enforcement. Phantom’s international client base reached Australia, with the encrypted devices believed to have been used in planning the murders of Sydney Hells Angels member Tyrone Slemnik in 2013, and drug cook and Hells Angels associate Roy Yaghi in 2012. No allegations of wrongdoing have been made against the manufacturers of BlackBerries. Allegations regarding the inner workings of Phantom and its links to transnational organised crime were revealed to the FBI when it managed to turn a drug trafficker into a “co-operating witness” after he was arrested in September 2015. An affidavit by an FBI investigator, which was attached to the arrest warrant for Mr Ramos, revealed witness CW-1 confessed his drug trafficking organisation moved hundreds of kilograms of cocaine from Mexico through the US, with Canada and Australia the intended final destinations. The affidavit explained encrypted devices were used in 2015 by CW-1 and his “Australian conspirators” to co-ordinate a shipment of 10kg of cocaine from the US, which was later seized by Australian Border Force. On another occasion, CW-1 had arranged 5kg of methamphetamine to be delivered to Australia, not knowing the person he was dealing with was actually an undercover agent. A year later, Australian Federal Police communicated with an unknown person in Los Angeles using a Phantom Secure device they had seized from a local resident who was arrested for drug smuggling. The LA contact successfully packaged and shipped 16kg of cocaine to Australia which was intercepted in September 2016. Special Agent Nicholas Cheviron — the FBI employee who wrote the affidavit — believes there are approximately 10,000 Phantom Secure devices in Australia. A surprisingly high number given his estimates of only 20,000 existing worldwide. The affidavit reveals that Phantom Secure ran its services through encrypted servers in Panama as it “does not co-operate with any other country’s inquiries”. To further improve the security, Special Agent Cheviron said existing customer were forced to vouch for any clients, who were also forced to undergo background checks. n its annual general report two years ago, the NSW Crime Commission said criminal gangs had been using encrypted BlackBerries, supplied by companies such as Phantom Secure. The NSW Crime Commission added encrypted phones were a fundamental tool for contract killings. “The ability to raise vast amounts of cash enables organised crime groups to source weapons and employ persons prepared to undertake murder for profit,” the commission’s 2015-16 annual report said. A NSW police officer said the recent bust would slow down organised crime, but wouldn’t fix the problem for good. “Murders, bashings and drug importations are all organised on these BlackBerries. This will hurt them for a while. Then they will find another source,” the officer said, reported the Daily Telegraph. B.C. corporate documents list Ramos as president and sole director of Phantom Secure. That year, the RCMP had undercover officers pose as drug traffickers to purchase devices from Phantom Secure, Cheviron said in his court affidavit. “During the vetting process, an undercover agent asked the Phantom Secure representative if it is safe to send messages that explicitly discussed drug trafficking, using the following examples ‘cocaine coming up,’ ‘sending MDMA to Montreal,’” Cheviron said. The RCMP undercover officers later pretended an associate had been arrested and asked Phantom Secure to delete his BlackBerry remotely. “So he picked up the load (of drugs) and I think he’s been arrested. There is a lot of f–kin’ sh-t on my BlackBerry,” the purported trafficker said. “Ramos explained that Phantom Secure was built specifically for the purpose of facilitated drug trafficking,” the documents said. “I believe the purpose of the vouch requirement is to prevent law enforcement from penetrating Phantom Secure’s network,” Cheviron said. The Vancouver company charges between $2,000 and $3,000 US for a six-month subscription. The documents indicate American authorities have several cooperating witnesses or “CWs” in the case against Ramos. 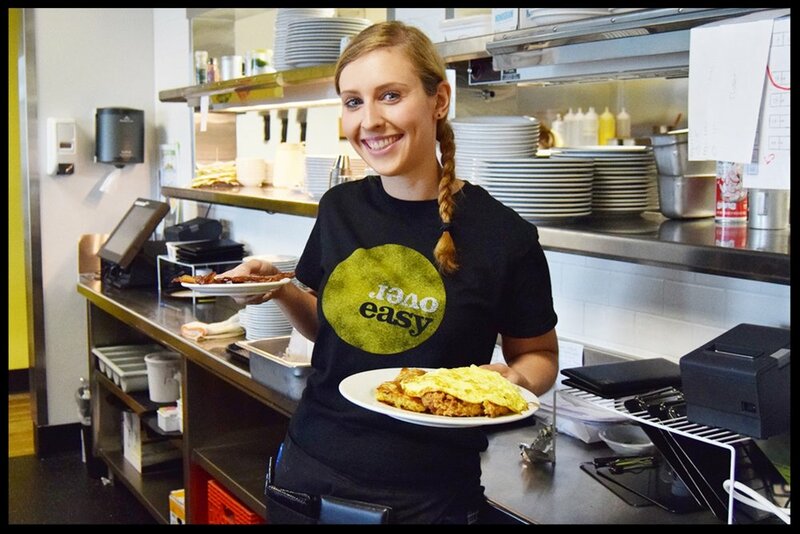 To owner Jamie Bohnett, it was just like any other day in early March at the Over Easy restaurant on James Street. Staff were on the last hour of the workday, a mother, her son and a few other customers were finishing their meals at nearby tables and Bohnett was doing some paperwork for the following day. There was only one other man sitting by himself at a table — eating chicken and waffles. What Bohnett didn’t know was that a few minutes later, the man sitting alone eating his chicken and waffles would be arrested by the FBI for allegedly providing encrypted BlackBerrys to transnational drug traffickers, including the deadly Sinaloa Cartel in Mexico, headed by Joaquin (El Chapo) Guzman. Ramos and four of his associates who remain fugitives were indicted by a federal grand juryMarch 15, according to the U.S. Attorney’s Office.